Traveling in Ecuador isn’t complete without a tour through Cuenca. On this page you can find more information and tips about tours, activities, sightseeing, restaurants and nightlife in this impressive cultural city! Cuenca, The Blue Pearl, or Athena of Ecuador! 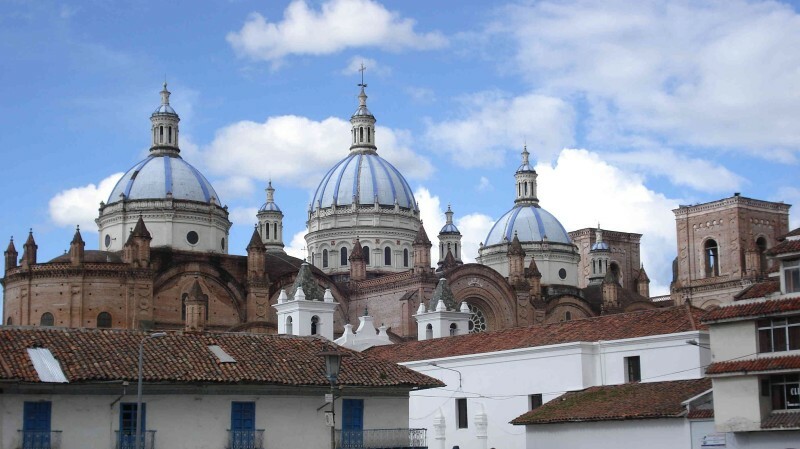 The city Cuenca has about 350.000 inhabitants, which makes it the 3rd city of Ecuador. However walking through the city center, it doesn’t feel at all like you’re walking through a big city. The picturesque city is located at an altitude of 2530 m above sea level and is crossed by 4 small rivers, the Tomebamba, Tarqui, Yanuncay and Macháncara Rivers. Its official name is “Santa Ana de los Cuatro Ríos de Cuenca” (The 4 rivers of Santa Ana, Cuenca). The city is named after the city of Cuenca in Spain, which coincidently (or not) also has 4 rivers crossing through its center. The official nickname of Cuenca is also “Atenas del Ecuador”, The Athena of Ecuador, because of its rich architecture and culture. Already since history, the citizens of Cuenca have always had a more than average interest for art, writing, sport, science and politics and several successful/ well-known Ecuadorians were born in Cuenca. Good about Cuenca is also that over the years it has managed to keep its charm. Cuenca is still the most cultural city of Ecuador, where history, the present and the future go hand in hand and where the streets are populated with Cuencanos and foreigners, commuters and salesmen, artists, showmen and tourists from all over the world! This cultural mix, the presence of several green parks in combination with colonial buildings and the use of bricks in many of the new buildings (instead of concrete, now commonly used in other Latin American cities), give the city a special and friendly vibe. This vibe, in combination with its climate (an average temperature between 10 to 26 C.) also makes Cuenca a popular city for Expats from the U.S.A. to retire. In 1999 UNESCO officially declared the colonial center of Cuenca to be a World Heritage. In the following Selection of Pictures you can appreciate for yourself the beauty of Cuenca and surroundings. The biggest highlight of Cuenca is actually the city itself. The Colonial architecture, mixed with colorful ancient and modern art, make Cuenca an attractive destination for cultural people. Depending on the weather it is recommendable to stroll early in the morning, o late afternoon through the city. You will be able to take great pictures of the colonial buildings with its shadows in the soft light of a low sun. While walking through the city, do be careful with the big blue city busses. Their drivers drive fast and their exhaust is black and thick… These busses are the biggest disturbance in Cuenca and hopefully many of them will disappear when the new electric tram starts operating. Its construction is already more than two years in process and is supposed to be finished in June 2017. When it is finished it will be possible to travel from the airport in the North, past the bus terminal and through the city-center, towards Tarqui in the South of Cuenca. The center of Cuenca was built on the ruins of an ancient Inca Town, which was likely called Tomebamba (bamba means valley in Quechua, the language of the Inca). At the shores of the Tomebamba River and on the property of the Pumapungo Museum (also named Museo del Banco Central), you can still observe part of these Inca ruins. The Pumapungo Museum is a well-organized museum with interesting information about the history of Cuenca and surrounding. The entrance is free and the museum is open each of the week, except on Mondays. In contradiction with their name, Panama Hats are not from Panama, but are made in Ecuador. The official hats are made from the leaves of the toquilla palm/plant, also called Jipijapa Palm. The palms with the best leaves for making Panama Hats grow on the coast of Ecuador in the Manabí province, between the towns of Jipijapa and Montecristi. Traditionally the best hats are made in Montecristi and in the past many of these hats were transported to Guayaquil and shipped to Panama, to be sold all over the world. Because of this trade route and because the light hats proofed to be very comfortable and useful to keep the heads of the workers cool during the construction of the Panama Canal, the hats started to become commonly known as “Panama Hats”. The best Panama Hats are still made in Montecristi and in 2014 an artisan managed to weave a hat with 4000 weaves per inch! It took him 8 months to complete the hat. For commercial and touristic reasons nowadays most Panama Hats are made in and around Cuenca and it is recommendable to try to visit one of the local workshops during your visit of Cuenca. One of the most known workshops belongs to the Homero Ortega Family: http://homeroortega.com/ Also the relative new Panama Hat Museum (Museo del Sombrero de Paja Toquilla in Calle Larga 10-41) is interesting to visit. When the old cathedral became too small, it was decided in 1884 to start building a new and much bigger Cathedral. Luckily they kept the old one open (even until now), because the construction of the new cathedral took almost 100 year to build! Both on the outside and inside the New Cathedral displays impressive architecture and a visit to Cuenca isn’t complete without a visit to its Cathedral. What not many tourists know is that it isn’t only possible to visit the Cathedrals sanctuary, but you can also climb the 154 small steps and visit a small terrace between the 2 main towers. From this terrace you have a good view on the blue/ white domes and the center of Cuenca. To reach the small round staircase to the terrace, you will have to pay 2 US$ to the person at the information office inside the Cathedral and then he or she will open a metal access door. For people who like nature and hiking, it is highly recommended to visit the National Nature Reserve Parque Cajas. The main entrance to this nature reserve is located about an hour outside of Cuenca, on the main road towards Guayaquil. It is easy to reach by taking any bus from Cuenca to Guayaquil and ask the driver to stop at the entrance of Parque Cajas. At the entrance there is a small museum with pictures and information about the flora and fauna that you can find in Cajas. There is also a small office from the park rangers, where you will have to register. Please take a copy of your passport with. At the moment of writing the entrance of all national parks and reserves in Ecuador is free. The main entrance of Parque Cajas is also the starting point of several self-guided hikes, which can take between 2 till 8 hours. Do keep in mind that you will be hiking at an altitude between 3150 m and 4450 m, which means that there will be less oxygen in the air. Also the climate in Cajas in humid and can be very precarious. Sun, rain and fog can replace each other in less than an hour! But if you go well prepared on a hike into Parque Cajas, you will be rewarded with amazing sceneries over rough landscapes with many lakes and unique vegetation! At first sight the landscape looks a bit like the Scottish Highlands, but then at a much higher altitude and with a very different, mostly low vegetation. There are also several small forests with Polylepis Trees (also called “Paper Trees”), that grow in winding forms and only at high altitude. When you are on a Sunday in Cuenca, you will have the option to visit the local Sunday-morning-markets in the nearby villages of Gualaceo, Chordeleg and Sigsig. Local busses to these markets departure every 20 min. starting around 5:30 am. It is best to travel first to Sigsig, which is the furthest away (90 min. by bus), because its market is only from 8:00 am until lunch time. The non-touristic market is popular with Ecuadorians, for selling cheap Panama Hats. From Sigsig it takes about half an hour to drive back to Chordeleg, which is known for selling textile and jewelry. Especially its fine silver jewelry is well known and popular. Gualaceo is only a 10 min. bus ride from Chordeleg, but it is nicer to skip this bus ride and hike in about half an hour through the countryside towards Gualaceo. The market of Gualaceo is the biggest market, but is sells mostly household stuff, food and animals. I highly recommend trying around lunchtime a bite of “Chancho al Horno”. This is very slowly roasted and therefor tender pork meat. Even if you don’t like pork, this meat might change your opinion. From Gualaceo it only takes 50 min. by local bus to ride back to Cuenca. Museo de Artes Populares (calle Larga y 3 de noviembre); this museum exhibits a collection of locally made masks and music instruments. Free entree. Museo de las Culturas Aborigenes; Calle Larga en Hermano Miguel, an interesting museum about the Aboriginal cultures. At the entrance there are several good guides available. Centro municipal artesenal ‘Casa de la Mujer’, is located close to Plaza San Fransisco. It is a good place to buy locally made handicrafts. As I mentioned earlier, Cuenca is an artistic city and travellers who are interested in art will feel very welcome in Cuenca. In September 2016 they even organized the second so called “Art Walk”. With the help of a special map (click on picture), participants were able to visit 55 artistic locations and this didn’t even include all that are present in Cuenca. Participation was free of charge and the event was mainly organized to make people aware of the artistic diversity that Cuenca has to offer. The walk included visiting ateliers of painters, artists who work with wood, textile, pictures, metal and even jewelries, but also small art shops, some colonial decorated restaurants and cafes, a cultural centrum and even a small theatre. Besides officially acknowledge art, the streets of Cuenca also provide a wide range of Street Art, including small performances and many murals. Some of those are really impressive and I can highly recommend you to have a stroll through the center of Cuenca and keep your eyes open for a portion of ‘Raw Street Art’. For those who don’t want, or can’t walk very well, it is also possible to join a sightseeing tour in an open double-decker bus, with either the yellow or red tour company. Their busses leave more or less each hour from Plaza de Armas (the Main Square). Tiestos Cafe/ Restaurant, calle Juan Jaramillo 4-89 y Mariano Cueva: www.tiestosrestaurante.com Already for many years this is one of the best, or maybe even the best restaurant of Cuenca. The menu of Tiestos has a good variation with local, national and international dishes and is therefore equally popular among families from Cuenca as international tourists. Its interior is classic and rustic, decorated with wood and rocks. Grill Resto Bar El Mercado, Calle Larga 8-27: www.elmercadocuenca.com is another very good restaurant. The owners are familie of the owners of Hotel Victoria. The menu of El Mercado includes national and international dishes, prepared with fresh local ingredients. Its peaceful interior is a combination of classic and modern, with the use of many green plants. They also have a coffee/ tea area with a great view over the Tomebamba River and the hills around Vilcabamba. In general its staff and clients are well dressed. Los Molinos del Batán, Av. 12 de Abril, at 100 m from the Vado Bridge. As the name suggests, this restaurant is located in an old water-mill on the shore of the Tomebamba River. Los Molinos specializes in local and national dishes and is popular with Ecuadorian middle/ high class families. It isn’t known among tourists. Raymipampa, this restaurant is located in and old colonial building between the New Cathedral and a popular ice-cream shop and it serves already for many years good food in big portions. La Esquina, Calle Larga y Hermano Miguel is a modern restaurant, known for good meat dishes and coffee. Anima, Cocina de Autor, Paseo Tres de Noviembre (“Puente Roto”) is an exclusive and stylish restaurant along the Tomebamba Rivier road. El Colgado, alongside the Tomebamba River trail, close to the stairs of Tarqui and with a small terrace, this restaurant offers a peaceful location to eat. The restaurant has a bit of an alternative menu, with many organically prepared dishes. Jodoco, Plaza San Sebastian s/n, is a small Belgium restaurant with a nice terrace to eat outside on sunny days and/ or balmy evenings. The menu isn’t very big, but has some original and good dishes on it. The owners also brew their own artisanal beer, which has a strong (8%) and a bit of a sweet taste. Note: Cuenca is home to several small artisanal beer breweries and the most known is called: Nordica. Café Austria, calle hermano miguel 8-81 y Bolivar is a quiet, comfortable restaurant and a good place to have a meeting, have coffee, breakfast and lunch. Puro Cafe, this small café is hidden right next to the Todos Santos Church on Calle Larga. It is a good place to quietly have a good coffee and pie on sunny days, with view over the outskirts of Cuenca. It is open from 9:00 am until 17:00 h.
Goza, also café Goza, at the corner of calle Larga and Presidente Borreo, is a good place to have coffee, breakfast and lunch. Its terrace is very popular with foreigners who live in Cuenca. Unfortunately its location is at a relative busy traffic junction. La Cigale, calle Honorato Vasque 7-80 y Luis Cordero, www.hostallacigale.com is a popular Bar, Restaurant and Hostel (in this order). Its restaurant opens each day between 8:00 am and 23:30 h, with Happy Hour between 16:00 h and 20:00 h.
Breakfast is alright, but lunch, dinner and the drinks are good. The bar is popular among Cuencanos, but also expats, volunteers and travellers know where to find La Cigale. If you want to spend the night in the hostel of La Cigale (convenient after a nights drinking) then do keep in mind that it is usually noisy until midnight. La Republica Sur, calle Presidente Córdova 5.55 y Hermano Miguel. Officially this is a Cultural Center, library, restaurant, café and bar, but among Cuencanos it is mostly known as a popular place to go out, for people who have a little more money to spend. There are often live concerts and shows. Nidia, Calle Larga 6-111 y Presidente Borrero, is a cool place and popular discotheque with 3 floors. There is an entrance fee and dress code to enter and it’s public is mainly between 20 and 30 years old. Wunderbar, Calle Hermano Miguel y Calle Larga, halfway the Stone steps towards the river. This bar/ restaurant used to be very popular, but at the moment of writing it was a bit quite. This might change again, because it is still a good place to have a bite, a drink and watch a popular sports game. Chiplote, Calle Larga, between Cordero en Malo, this is a popular Fast-food/ bar with Texas/ Mexican influences. It is also a popular place to watch (American) Football and other popular sport events. La Mesa, Calle Gran Colombia entre Vargas Machuca y Tomas Ordónez; Already for many years, Thursday night in La Mesa is known as “The Salsa Night” of Cuenca. Salsa Discotec, calle Larga, below ‘Puente Roto’, is another good place to dance Salsa (Merengue, etc.) on Saturdays. Its public is a bit older (25 till 45) than in La Mesa and the place isn’t known with tourists yet. La Zoociedad, Av. 12 de Abril y Vincente Solano, is an informal, cheap place to go out that is popular with Cuencanos between 20 and 40 years old. Besides the options mentioned above, there are many more restaurants and places to go out in Cuenca. Many you can find in Calle Larga, Calle Juan Jaramillo, Calle Presidente Córdova and along the Tomebamba River. The center of Cuenca is relative safe, because of the presence of many cameras that keep 24/7 an eye on the streets. Still, after midnight/ when the streets are getting quite, it isn’t recommendable to walk alone. Better just to take a taxi. When you go out in Cuenca, or actually in the whole of Ecuador, keep in mind to bring a copy of your passport with. Bars, clubs, discotheques, etc. are by law obligated to ask for your I.D. before allowing you to enter. Most of the water from the taps in Cuenca comes from the Cajas Nature Reserve. You are supposed to be able to be able to drink it straight from the tap. However, I believe that the water from the nature reserve is safe to drink, but I do have my doubts about the quality of the tubing below the streets… To use the water to brush your teeth is no problem. In Cuenca, or during a tour into the Nature Reserve, it isn’t only tasty to eat fresh trout from one of the lakes in Cajas, but it is also good for the environment. Originally there was no trout living in Cajas, but years ago they were introduced by humans. On Sundays many middle class families who live in Cuenca visit their families who live outside of the city and/ or visit their second home in the countryside. Because of this movement the center of Cuenca is often more quite, or even boring on Sundays. Many shops and restaurants are also closed on Sundays, or close their doors directly after lunch. Taxi’s in Cuenca (official in the whole of Ecuador), are obligated to use a taxi-meter. And official taxi’s also have a camera that films the inside of the taxi. A ride from the bus terminal to the center of Cuenca doesn’t have to cost more than 2 till 3 US$ for the taxi, depending on the traffic.